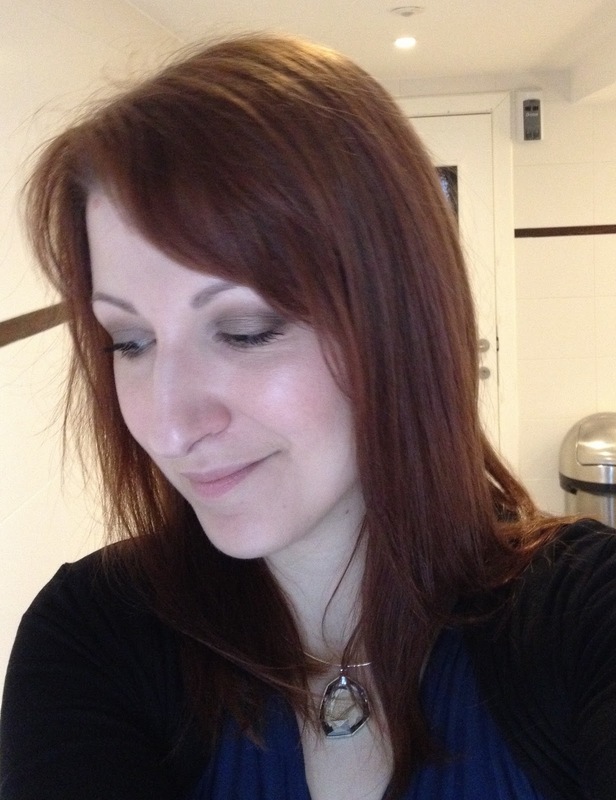 You may know that Marlena at Makeup Geek did launch her makeup line last November. 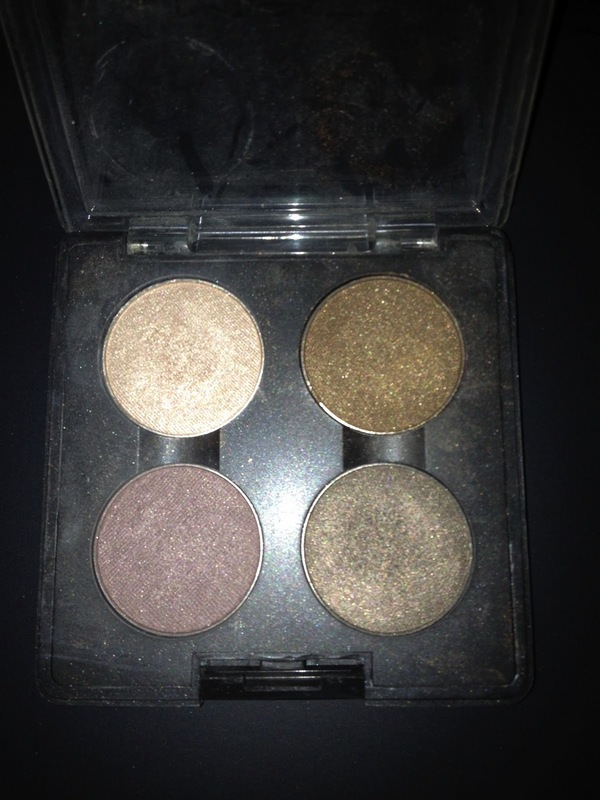 For now, the range consists of about 60 eyeshadows, there are also lip products and blushes in the making for 2012. I have tried quite a lot of the eyeshadows right now, but it would be hard to review them all in detail. You saw me using Corrupt, the matte black, in my New Year's Eve makeup and I still think this is the best matte black I've ever used. Next to that one, I decided to pick up a quad of shadows that, in my opinion and considering my personal tastes, are standing out of the lot. Introducing, from top left to bottom right: Shimma Shimma, Pretentious, Twilight and Moondust. 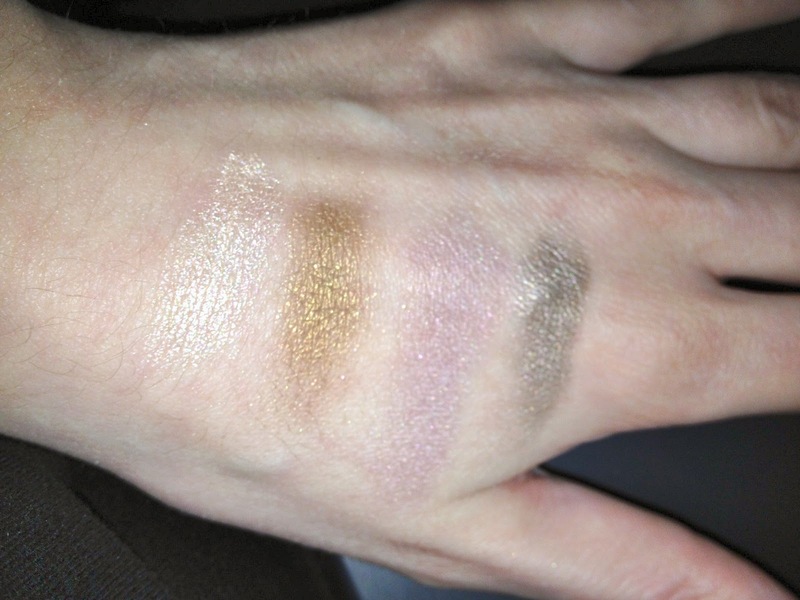 And here are some swatches for you, both pictures were taken with flash (daylight is rare, these days). Shimma Shimma is a gorgeous shimmery champagne, and believe it or not, I had nothing like it in my collection even though I had been looking for a similar color for quite a long time. It's not leaning yellow like Mac Nylon does, and even though it's shimmery, it's not glittery at all. The pigmentation is excellent and the texture is very soft. Bottom line: the perfect inner corner or browbone highlight, also very nice wash shade to combine with a dark matte crease and some liner. Pretentious is a beautiful bronze. Call me errh, pretentious, but I love the name too :) This is more yellow than Mac Bronze but more bronze than Mac Tempting, with a shimmery finish and a very nice texture. The pigmentation is very good too. Bottom line: gorgeous all over color, I like to wear it on its own with dark brow liner, like I would do with UD Deeper, for example. Twilight is a taupe with a plum/lavender undertone. Although I find it a bit harder and less pigmented than the other 3, I do find it's a very nice crease or blending shade, that reminds me a bit of Mac Style Snob (which was LE, so this would be a good substitute). Moondust might be the most unique shade in the range, at least when it comes to neutrals. If Mac Patina and Mac Vex had a lovechild, it would be MUG Moondust. This reminds me a bit of Lancome Erica F or Urban Decay Mauwi Wowie, but minus the chunky glitter and with a less green and more grey undertone than those two have - which I do think looks better on me. The pigmentation is absolutely awesome and the texture is really buttery soft. Not only is this color unique, I think the quality is also incredible. Here's a quick FOTD I did with Moondust (inner 2/3rd of the lid) and Pretentious (outer 1/3rd and crease). Makeup Geek eyeshadows are $5.99 each (pro pans only) and sold here; international shipping available. Oh! I like that palette! Can you steer me to a blog for women over 50? Makeup blog that is. Thank you. The Givenchy Spring haul, and a Chanel makeover! Could I be a Lipstick Bandit?